Wecyclers solves the urban waste challenge for households and recyclers. 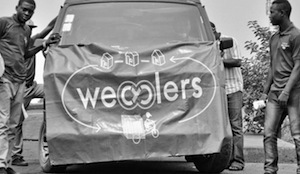 Wecyclers uses a fleet of low-cost cargo bicycles to offer convenient household recycling service in densely populated low-income neighborhoods. We motivate families to recycle plastic bottles, plastic sachets, and aluminum cans through our SMS-based incentive program. For every kilogram of material that families recycle with us, they receive redeemable Wecyclers points over their cell phones in return. Families can then redeem their points for goods that they value, such as cell phone minutes, basic food items, and household goods. Families receive collection reminders and rewards updates directly on their mobile phones making the benefits of recycling immediate. After collection, Wecyclers aggregates the material at the household level to sell to local recycling processors. Wecyclers provides a consistent supply of well-sorted, high quality recyclable material to processors alleviating their supply constraints. Lagos, Nigeria faces a sobering waste crisis that will only worsen as the city’s population of 18 million people continues to soar. The overburdened municipal government collects only 40% of city garbage and a mere 13% of recyclable materials are salvaged from landfills. People living in slum conditions without formal waste collection are subject to increased flooding, disease spread, and psychological stress that results from unmanaged trash heaps. Concurrently, recycling firms in Lagos face a supply constraint—they cannot access and adequate supply of quality materials to process. One large recycling firm is operating its factor 50 to 60% below capacity.